for direct sales and party plan marketing. As seen in the Dallas Observer! This simple 30-minute technique works fast! of party plan sellers worldwide! just a proven system that works today, tomorrow, next week, next year...whenever you need more leads than you can handle! There was a really motivated and excited person who signed up with a party plan company. Visions of money, prestige, success, leadership danced in her head as she started off. She ran out of leads. She ran out of bookings. She started to run out of steam for the excited joy and belief in her new business venture. Soon her product inventory started to gather dust and her phone stopped ringing. She started to feel foolish for ever thinking she could really have a successful team, make lots of money or even build a business that would pay for her phone bill, much less buy a new house. If she could only find some more bookings, she just knew she could make it, but her friends and family were tapped out and she didn't know where to turn...She knew to be successful that she needed to GET BOOKED SOLID! This may be your true life fairy tale. Trust us, you're not alone. The business of your dreams is within your reach but only if you learn a solid, repeatable system that will help you get more party plan leads than you've ever had before. Looking for a good, solid party plan leads and marketing system that really works is confusing and frustrating. Everyone promises to give you the "secrets" if you buy their system. Sorry to burst your bubble, but there are no "secrets" or unknown mystical forces for success out there (but we're sure you already knew that). We hate hype, so we'll try to steer clear of it here. You'll be spared anything hyped up and suspicious (you already know the old adage about things sounding too good to be true). Besides, if it's hype you want you can find enough of those out there on the internet already. That's why our system comes with this promise: It's simple, complete, fast and cheap. A unique, simple system that works! If you are a direct sales and party plan professional looking for more bookings, more leads and more sales, you can TRIPLE your leads, sales & recruits in just 10 minutes. You can TRIPLE your leads for a powerful boost in sales & recruits in just 10 minutes. You love your products and services but feel frustrated trying to find new party plan bookings and customers quickly and easily? Have you placed ads, cold-called, hit up friends and family, exhausted your "circle of influence"? Have you always wondered "How did they get to the top levels of management?" How can I get there too? Have you had moments of doubt wondering how in the world you were going to find more direct sales leads and customers? Are you naturally a rather shy person...not good striking up conversations with strangers? Do you have a team that needs to be inspired? Are you eager to grow your party plan business? Are you new to the business and need a solid way to hit the ground running? There is finally a quick and easy way to get more party plan leads than you've ever had before! NO doing anything but promoting your own products & services! We promise to give you a straightforward, step-by-step program to GET BOOKED SOLID! No tricks, gimmicks or hype. This program utilizes a proven method used by numerous multimillion dollar companies worldwide to increase their customer base, leads and sales. or even remotely unseemly. It's just a simple, under utilized technique that works if you work it! We are not going to spend time telling you how to choose a business, be a team leader or manage your accounting systems. There are no party games, how to start a website, blogging ideas, social networking ads, etc. There are other resources to address those. system is a sure-fire business builder! re-sell the same old regurgitated information. Our products contain original content developed expressly for the party plan and direct sales professional. Sorry to sound so stern, but with all the you-know-what circulating the web it's easy to get overwhelmed and just shut down before you can get a chance to do anything. We know, we've been there. After a few hours researching, it can be easy to get overwhelmed by all the "so-called" authors out there with books to sell. It's enough to make you want to turn off your computer and flip on the TV and turn into a jelly-brained mess. We've tried to give you the information to make decisions without beating you over the head. What we promise to give you, we'll give you. Promptly and with a cheerful smile on our face. We're located in the good old U.S.A. Email us and we'll personally email you back within 24 hours. If you have questions, just write to us. We'll answer as quickly as possible with the same cheerful attitude. If you have a problem, just let us know and we'll have it solved within 24 hours. when we do business out there in the big, bad world. We're real people on this end. We really wrote and published this book and all of our books and products (that's really me on this site with a copy of the Direct Sales Guide: Get Booked Solid!). Something that may seem a bit old fashioned...ORIGINAL CONTENT. Our products are not re-hashed copies of stuff you can get anywhere else. was written for the hesitant salesperson--the person who really wanted to succeed and sell more and recruit more--but who procrastinates trying to find new leads. Ask yourself ... are you really SERIOUS this time? Is this the year that you really pick up the reins and steer your business to the next level? If you are serious about really growing your party plan home party sales business and developing a team, then the principles in GET BOOKED SOLID! will enable you to that quickly and easily. You can get started as soon as you receive it. There are numerous new leads in your very own hometown that you can easily get? They're out there right this minute and you could be benefitting from the simple way you can get to them without placing expensive ads, cold-calling, begging people to hold parties, etc. Triple Your Leads, Sales & Recruits! the amount of leads, customers and sales you currently have. And more...nearly any direct sales program/organization! Like we said before, this is not some "miracle," but a valid, easy and quick way to increase your customer base...virtually overnight! If you've got 10 minutes in your busy week, that's all you need. Our techniques are an terrific way for non-salespeople to build a sales-oriented business. If you have ever wondered "Who am I going to find to do another party?" "How can I increase my customer base without spending a lot of money to rent booth space at bazaars and trade shows?" We offer the answer and plan to you in an easy to follow, step-by-step guide. We will tell you what to do, how to do it and what to do when it starts working really well. START THE DAY YOU GET THE BOOK. You can get started the very day you receive GET BOOKED SOLID! There's nothing else to buy. You already have everything you need to work this program. Hold 24 home sales parties? Get 12 new direct sales recruits? Sounds kinda impossible, doesn't it? For that you'd need to really work your tail off andspend a lot more time than you have. Maybe you don't even want to do that much. Maybe you just need an extra couple of home sales parties a month or maybe just two or three new recruits would knock your socks off. Grow your party plan business, Finally develop a rock-solid business that you can count on month after month. The best home businesses really make money and give you a chance to control your schedule. At worst, they become "hobby businesses" that can actually cost you money to run. Which is yours? Which do you want? Get more party plan leads! This sounds great so...what's the catch? We know this technique works. We know it works well. If you are serious about making your party plan business really grow--and we mean quickly!--this can help. Once you get those leads, you will still have to actually get out your calendar to book the party, coach your hostess, sell your products, fill re-orders, handle inventory, recruiting and administration. There is no special glittery path around working to achieve, like some marketers want you to believe. It takes consistent effort to succeed. The only difference will be that with GET BOOKED SOLID!, you'll have the tools to make customers plentiful, build referrals and promote your product to larger audiences...in 30 minutes or less! Come on now! In 30 minutes I will increase my customer base and sell more products? you can literally make your business double in under 30 minutes...and without spending any money. You CAN do this in under 30 minutes! GET BOOKED SOLID! will have ideas that will not only get you booked, but it will help get you more downline recruits. "What could possibly be that terrific that I haven't thought of it? What would allow me to double my leads in under 30 minutes?" We know there are many programs that promise you can stay in your bathrobe all day and still earn $400,000 per year. We don't promise miracles, but if you work the plan laid out in GET BOOKED SOLID!, your party plan leads and direct sales opportunities will increase and you will have much more fun with your business! It will tell you exactly how you can get your business in front of many, many more possible customers...without spending any money, doing things that are uncomfortable or spending lots of money. It's great for those in new towns who do not have a huge network of friends/family nearby. It's perfect for those who are shy or new to sales. It doesn't allow for any of those tired old methods used by party plan companies in the past. There's no lurching toward every new prospect on the street, starting up chatty conversations (all with the intent to drop a net over their head), or pick up the phone and (yikes!) call people they don't know. If you are truly serious about building your business, earning 2, 3, 4 or 5 times what you earn now and having a lot more fun doing it, then GET BOOKED SOLID! will get you going in the right direction. skincare, books, lingerie, adult items, cosmetics, cookware, toys, candles, food, wine, etc.! Get the entire system + bonuses! profits in your business due to lack of leads! profitable party plan leads and direct sales booking system immediately! 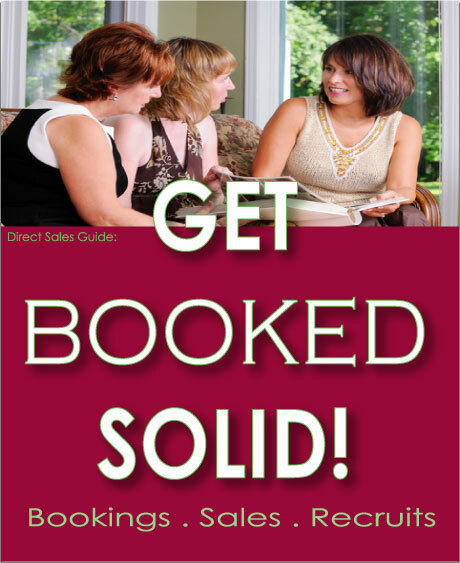 Direct Sales Guide: Get Booked Solid! and they are precious to us!